We're having fabulous weather at the moment, the flowers (and weeds) are growing like crazy, and there are loads of butterflies around, so I thought I'd show you a picture of my garden. No, not this picture, you'll have to scroll down for the real thing. The stencilled/paste-embossed background was in my stash from a stencilling session waiting to be coloured, so I sponged Distress Inks over it and stamped some leaves, and it was all a bit vibrant (I was getting carried away with that sunshine) so I flicked some water over it, water-bleached some butterflies and sponged it with Antique Linen to calm it down a bit. 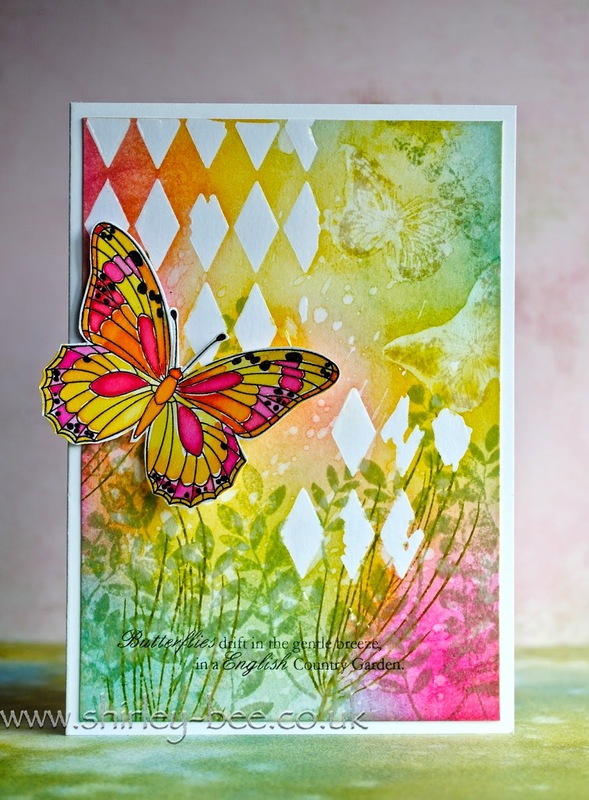 The big butterfly was sitting in my stash - I'd made it for a DT project and ended up not using it, so it was perfect for this card. A few challenges have aligned perfectly for me. 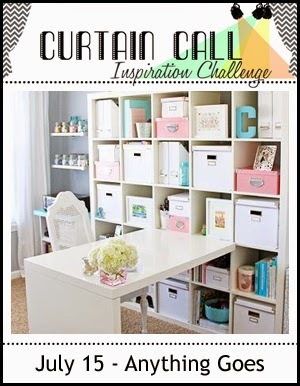 At Simon Says Monday Challenge, it's Summer; at Simon Says Wednesday Challenge, it's embossing; at Uniko Studios it's Anything Goes; and the curtain is coming down soon at Curtain Call Anything Goes. Gorgeous card Helen, and a great photo of your wonderful garden. Love your card, Shirley! So many beautiful elements! And...your garden...it's just lovely! Stunning card full of colourful wonders! I live the pop of white on top.. Very effective! Woo-Hoo! This is beautiful! And your garden is also. Shirley, totally love your card, the colours are perfect. The mix of media, the butterfly. WOW want to make one just like it though I doubt I could ever capture the vibrancy. As to your garden, the photo shows such a wonderful garden. I would love to be sitting in that garden right now, of course its winter here and nothing much growing other than weeds. I'm very good at weeds. So pretty! I love how you did the background! Your garden is simply amazing!!! And huge congrats on your Paper Players win - that card was stunning. This one is really pretty, too! What a fabulous colourful card, love all the techniques you've used. Especially love the butterfly. Wow, this is gorgeous, what fabulous use of colour. 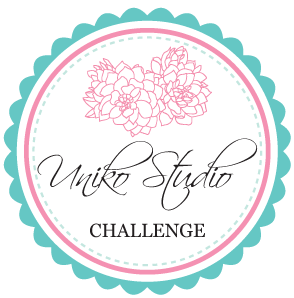 Thank you so much for joining in the Uniko Challenge this month. This is 100% perfect! Love everything about it!!!! !